Secretary of the Navy Ray Mabus on alternative energy. 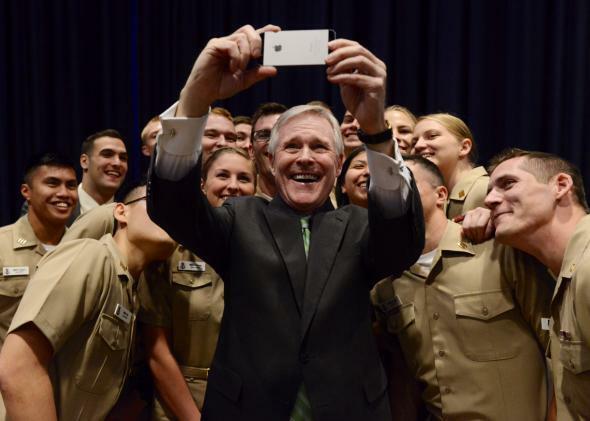 Secretary of the Navy Ray Mabus takes a selfie with midshipmen assigned to the Navy ROTC program at Arizona State University. Selfies and secretaries of the Navy aren’t something you usually think about together. But the signature photo technique of today’s teenagers seems to have infiltrated even the highest echelons of U.S. security. But the selfie was just a brief diversion in Mabus’ discussion about making alternative energy use a top priority in the U.S. Navy and Marine Corps. Environmentalists may laud Sec. Mabus for his Earth-friendly agenda, but finding alternative energy sources to fuel ships and aircraft is about war, not climate change, Mabus said. The U.S. Department of Defense is the largest consumer of fossil fuels in the world. Each year the Department of Defense budgets approximately $15 billion for fuel. In fiscal year 2011-2012, spikes in the price of oil cost the Department of Defense an additional $3 billion in unbudgeted fuel expenses, Sec. Mabus said. Reducing operational capabilities may not be such a good idea especially when some predict instabilities due to climate change are nigh. The Navy even has a special Task Force Climate Change to address security threats that could crop up from the rise in sea level and opening of Artic sea passages in the melting polar caps. Mabus said the Navy and Marine Corps are on-track to meeting the energy goals he laid out in 2009, which includes supplying half of all naval energy needs with alternative energy sources. Correction, April 29, 2014: The photo credit in this post originally misidentified the photographer. The photo was taken by MC1 Arif Patani, not MCC Keith DeVinney.